Isn’t this our time to feel free? Isn’t this the way it’s supposed to be? Somedays, son, the big one slips away. Just find the narrow path and you’ll get home. So don’t worry, son, you’ll never be alone. How can you ask if there’s still hope for us to start all over again? How can I trust that you’d love me now when you didn’t love me then? When every step we take feels like another unknown leap? 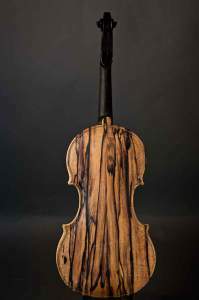 Barry Dudley is a violin maker in Georgia who specializes in building five-string fiddles. 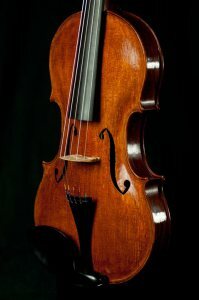 Traditionally, the violin or fiddle has four strings that are tuned to G, D, A, and E, but a five-string fiddle also includes a lower C string. This combination gives the fiddle a tonal range of both a violin and viola. 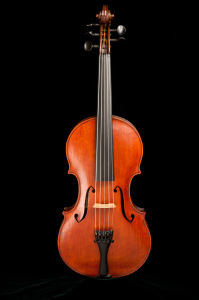 Although the five-string fiddle is allowing musicians to have a new approach to their playing, historically, bowed instruments with five strings are not a new invention. 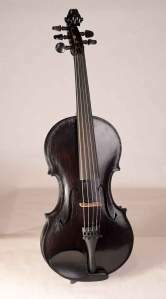 Jerald Franklin Archer compares five-string violins to similar instruments used in the past in his article 5 String Violins: The Black Sheep of the Family? 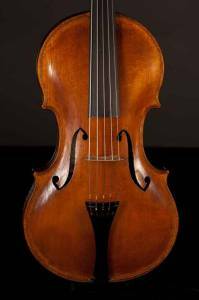 “The instrument a violinist is familiar with evolved from the viols and some other instruments like the Pardessus de viola, or Quinton, a five-string hybrid instrument, in use during the 18th century, that combines characteristics of the viol and the violin. 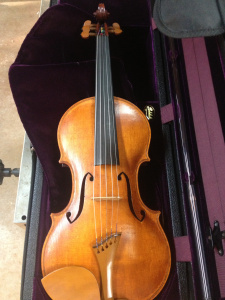 Its body resembles a violin’s, save for the sloping shoulders; but its neck is fretted like a viol’s. It was tuned g-d’-a’-d”-g”. 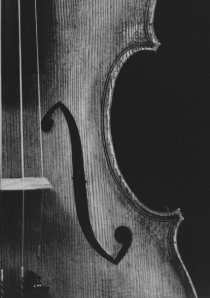 A fifth string was also included on cellos. “J.S. 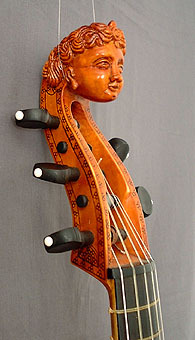 Bach wrote his last solo ‘cello Partita for an instrument known as the piccolo cello, which was smaller than the normal size of a ‘cello and possessed an added high E string.” The pardessus de viole is the smallest size of viola da gamba, which is the ancestor of the modern double-bass, and it was created around 1690. It started out as an instrument with six strings and then was modified to have five and four strings. 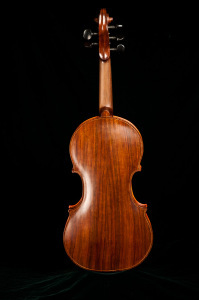 The quinton is a variation that has a body similar to a violin. 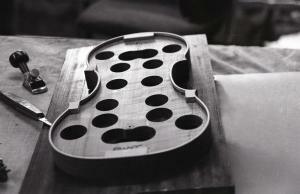 Barry Dudley began building five-string fiddles sometime between 2004 and 2005. He became inspired to build instruments as a guitar player in the early 1970s when he visited Diapason Guitar Shop in Decatur, Georgia, and saw Wade Lowe, a guitar maker and the owner of the shop, carving the headstock of a classical guitar. Wade Lowe became Dudley’s mentor and muse. He did not start building instruments until about twenty years later when he bought a book and taught himself how to build guitars. He took his first guitar over to Wade Lowe, who had been making violins at this point. Lowe told Dudley, “You need to make violins!” Dudley responded, “I can’t play a violin. I don’t know anything about them. 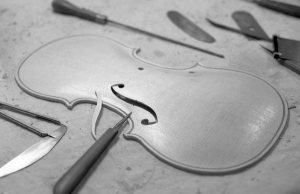 I don’t wanna do that.” Wade Lowe was persistent and convinced Barry Dudley to try building violins. After he finished his first violin, he admitted that he was hooked. 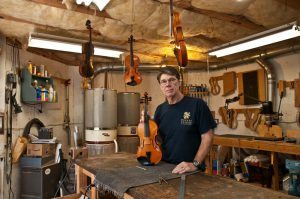 By 2004-2005, David Blackmon, a fiddle player from Athens, Georgia, visited Dudley’s shop and convinced him to make a five-string violin. He decided to try it and was very satisfied with the results, so he built a few more. 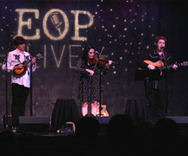 He took one of his five-string violins to a venue in Athens, Georgia, where The Duhks were playing. 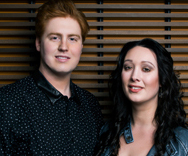 Their violinist, Tania Elizabeth, played his fiddle and ended up buying it from him. Tania Elizabeth was recently seen on the David Letterman Show playing the same violin she bought from Dudley. 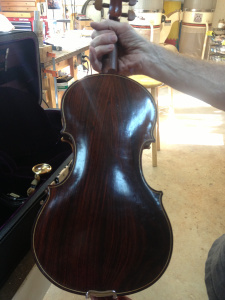 Barry Dudley acquires his materials for building fiddles from a few suppliers that he has developed over the years. He buys woods from a supplier in Oregon. 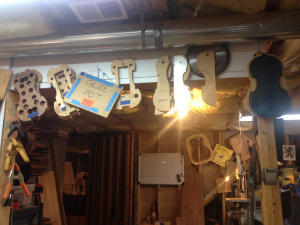 His tops come from a company in Missouri that supplies tops for Collings mandolins and guitars. He buys maple in lots of thirty or forty sets at one time directly from Bosnia. Then, he brings it into the shop, measure the moisture content, and puts it up on a shelf to acclimate and age. 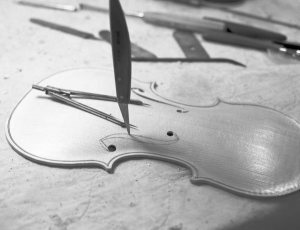 On average, it takes about 130 to 150 man hours to build one fiddle, and he spends about eight to ten hours a day building. 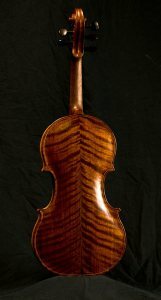 Barry Dudley prefers the sound of Guarneri violins over Stradivari violins, so he has always used Guarneri patterns for building. 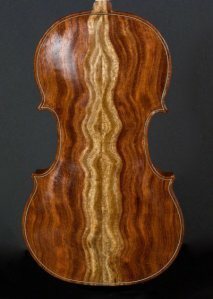 The first pattern he ever used was Guarneri’s King Joseph. 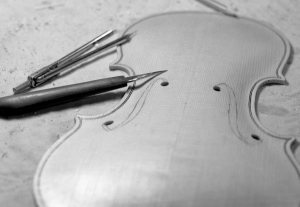 After making a few violins from that pattern, he changed to a pattern from the violin that Niccoló Paganini made famous, The Canon. He bought a set of prints and expanded them about 110%, and that became the pattern he uses for five-string fiddles. 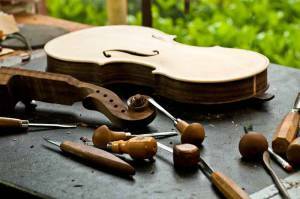 Dudley uses a variety of woods for building violins. He explains that traditionally, violins have always been made out of maple. 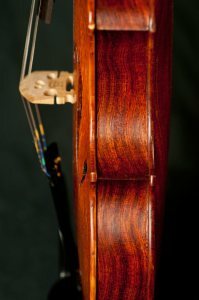 The backs, sides, and neck are usually maple, and the top is always some type of spruce. 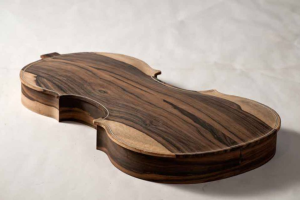 Since he began building instruments as a guitar maker, he became curious about using popular guitar woods for building violins. He tried building some with traditional guitar woods such as rosewood, mahogany, black walnut, bubinga, which is an African wood, and ebony. 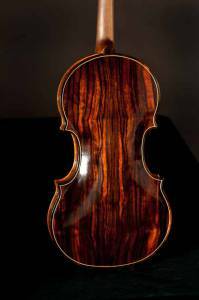 He has also built fiddles from cocobolo, ziricote, imbuia, and shedua. Dudley noticed that many professional or proficient fiddle players became interested in the different types of woods for fiddles. 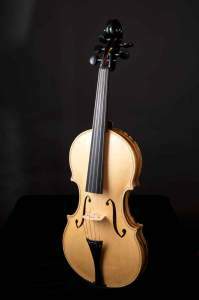 Since these players usually already have good instruments built from maple, many are open to trying a unique fiddle made out of a different type of wood. The main difference between the types of wood he uses is the density, because certain woods are denser and heavier, but he said, “the harmonics and the overtones that are produced from those denser woods are a little more refined, and you get a little more separation between the fundamental, and the secondary, and tertiary harmonics.” Dudley said that he gets the most requests for fiddles made out of bubinga, but it is also the most difficult to work with because the wood is really hard. His favorite wood to work with is ebony because it is more fine and easy to carve. 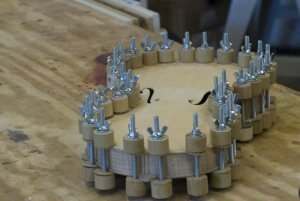 Dudley mentions that he has an idea of how a fiddle is going to sound based on details in the wood while he is building it. During different stages of building he holds up the wood and taps on it to listen to the tone that it produces. He listens for resonance, sustain, and a lively sound. 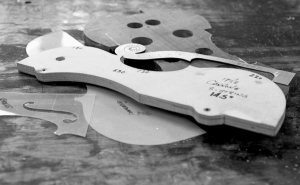 Even early in the building process, these factors determine if the fiddle is going to be outstanding or just good. 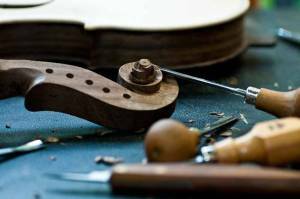 Barry Dudley states that there is a growing demand for five-string fiddles, and about ninety-five percent of the instruments he builds are five-strings. He states that five-string fiddles have more playing options and the lower C string offers fiddle players a different tonal range that is great for improvising and backing up singers. 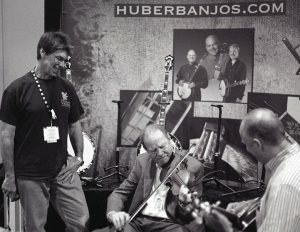 “I’ve had a lot of fiddle players tell me that they can play licks kind of like a saxophone player, you know — that it allows them to do a lot more things that — that they just never really thought they could do before.” Dudley thinks the five-string fiddle is unlimited in what it can do in contemporary music. He has even had customers that are strongly rooted in classical music use their five-strings to play chamber music. 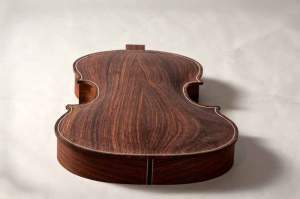 Barry Dudley believes that there is a growing demand for five-string fiddles, and about ninety-five percent of the instruments he builds are five-strings. Five-string fiddles have more playing options and the lower C string offers fiddle players a different tonal range that works great for improvising and backing up singers. He has even had customers that are strongly rooted in classical music use their five-strings to play chamber music. Dudley thinks the five-string fiddle is unlimited in what it can do in contemporary music. Barry Dudley currently shows his instruments at two events per year. He travels to IBMA and to Barcelona, Spain. He has been invited to come to Merlefest and is considering traveling there next year. This video shows two jazz violinists playing on Barry Dudley’s five-string fiddles. Oriol Saña is a jazz professor in Barcelona. Brittany plays a Barry Dudley rosewood 5-string fiddle, made in Monroe, Georgia (no.75) and Robert Kain fiddles, made in Campbelltown, Pennsylvania. She travels with her Blueridge BR-40TCE Tenor Acoustic-Electric Guitar. Her mandolin is a Kentucky KM-675 F-Style. She also plays a banjolin from the 1800s. Mitchell plays a C.F. Martin CSN (Crosby, Stills & Nash) Gerry Tolman Tribute Edition Dreadnought Guitar, serial number 1237354, made in Nazareth, PA in 2006. He travels with a C.F. Martin Custom Jumbo Rosewood Performing Artist Acoustic-Electric Guitar, serial number 1802846, made in Nazareth, PA in 2014. He also plays Taylor Acoustic-Electric 6-string and 12-string Guitars. 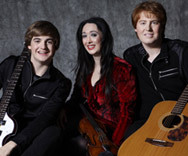 Raven and Red uses Fishman LoudBox Mini Acoustic Instrument Amplifiers, AKG, Audix, and Heil microphones on stage through the Bose L1 Model II Portable System.